(GOLDENDALE, Wash., May 9, 2016) – Maryhill Museum of Art will host the 12th annual Pacific Northwest Plein Air Event in the Columbia River Gorge, to be held August 22-28, 2016. 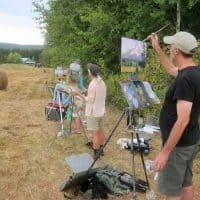 Drawing on a long tradition of painting in the open air, this juried event attracts some of the finest painters from the Pacific Northwest, and from across the country, to capture the stunning light and inspiring vistas of the Columbia River Gorge. The 40 participating artists will spend the first four days of the event painting in various locations throughout the Gorge; an opening and artist reception will take place Friday, August 26, 2016 from 5 to 7 p.m. at Maryhill Museum of Art, when the public is invited to view and purchase “fresh” paintings and meet the artists. The paintings will remain on view at Maryhill through Sunday, August 28, 2016. The Juror for the Pacific Northwest Plein Air Event in 2016 is painter Terry Miura, who began his career in New York as a successful illustrator, with work appearing in such publications as Time, Newsweek, Rolling Stone, and Sports Illustrated. Miura transitioned to a full-time painter after returning to the West Coast in 1996, and is well known for his atmospheric landscapes and cityscapes, as well as evocative figurative works. Miura’s paintings are held in numerous private and public collections, including California Museum of Fine Art, Los Angeles, Calif., The Crocker Art Museum, Sacramento, Calif., and the New School for Social Research in New York City, among others. Miura lives outside of Sacramento, California. A full list of participating artists is available at www.maryhillmuseum.org/inside/event-directory/pleinair. Friday, August 26 | 5 to 7 p.m. The public is invited to view the paintings artists created in plein air, meet the artists and enjoy wine and hors d’oeuvres. Artwork will be available for purchase. Awards will be given in a number of categories, including “Best Sky,” “Best Mountain,” “Best Water,” “Historic Columbia River Highway Award,” “Maryhill Museum of Art Award,” and a purchase award. Saturday, August 27 | 9 a.m. to 4 p.m. Spend the day working with painter and 2016 PNW Plein Air Event juror Terry Miura. Each student is expected to bring their own easel (plein air set-up) and supplies (confirmation and supply list will be emailed upon registration). Please contact Terry Miura directly for registration and payment at http://www.terrymiura.com.